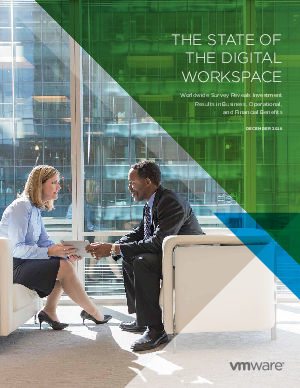 The VMware 2016 State of the Digital Workspace Report was performed in July 2016 and is a study that examined digital workspace adoption among global organizations across industries. Data represents a survey of 1,263 business decision makers (BDMs) and IT influencers to examine the worldwide progress in transitioning from the client-server era to the mobile-cloud era. Respondents acknowledged that game-changing IT relies on organizations adopting a digital workspace that includes security and identify management as vital components. With realistic prospects of achieving astounding return on investment (ROI), even businesses that cited obstacles to adoption may want to consider taking another look at business mobility initiatives.